Whether we like it or not, it's December and getting colder and with that (in some places) comes snow. I tend to stay inside most of the winter on my couch watching movies with popcorn. One way I keep my hands busy during a movie is making bracelets and winter themed projects such as a paracord wreath, candy cane, or Christmas tree. As I've said many times, paracord is a necessity to carry on you, in your car, or to have in your survival bag. There are many ways you may need or want paracord for in the cold, harsh winter months. A tow rope is something everyone should carry in their car, especially those where it snows and the roads get icy. Unfortunately, it's all too easy to hit black ice and slip into the ditch and get stuck. Having a paracord tow rope can save time and money. There are many different ways to make this depending on the weave you would like to do. Para-Max is a great cord to use for this since it's rated at 1,000 lbs. 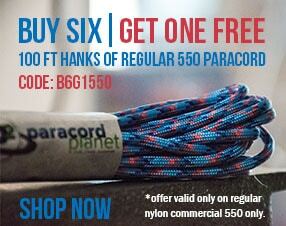 You can also make a tow rope out of 550, 650, or 750 paracord as well, you'll just need more cord. As much as I hate winter, it's really pretty outside and makes me want to do something outdoors. However, I can't ski, I don't have a snowmobile, and I refuse to run when there's ice on the ground. Solution: snow shoeing! This is a fun activity that gets you outdoors, moving, and requires very little skill. Learn how to make your own paracord snow shoes here. The steering wheel cover is one project on my calendar. I NEED this. Living in Fargo, ND it gets cold. And windy. If I forget my gloves, my hands not only freeze outside, they freeze while holding the steering wheel. On the flip side, the steering wheel also can get incredibly hot in the summer. This steering wheel cover is the perfect remedy. Not only that, when anyone gets in your car, they will notice your steering wheel cover and you get to talk about how much you love to craft with paracord! Learn how to make your own here. If you're out hunting, hiking, or just generally a boot wear-er you should carry extra paracord on you. You can fix broken laces in a pinch with paracord. 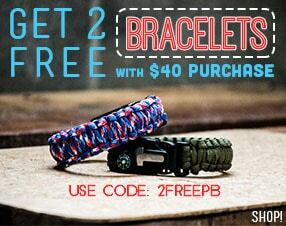 Which also ensures that you always have paracord on you for a more pressing matter if needed. This is a project that's good to have for the winter as well as summer. It gets dark earlier in the winter (ugh) and you may end up doing more in the dark than usual. It's a good idea to have a safety vest on if you're out walking the dog, running, hiking, or if you get stranded and need to find help. This is such an easy design that can fit over a winter jacket. Reflective or Glow in the Dark 550 cord will both work great for this. What projects are on your list this winter?